There's something I just plain like about the music of northern California guitarist / singer / songwriter Mighty Mike Schermer. Actually, there's a lot to like about him: his very tasteful guitar playing, creative songwriting, and easy, laidback vocal style. Schermer puts it all together on his latest album, Bad Tattoo. It also helps that he's put together an impressive array of musicians to back him on the album's dozen cuts, with the sessions being recorded at Kid Andersen's now-legendary Greaseland studio. One can't help but feel sorry for Schermer on the first number, the up-tempo blues "She Won't Be Coming Back." He wakes up to find out that his woman is gone and took everything he had. "... I talked to her last night and everything was cool, the minute I turned my back she ran off with some other fool, she's gone, I still love her, but she won't be coming back ..." There's some really nice horn work here from Eric Bernhardt and Nancy Wright, along with organ from Austin Delone and polyrhythmic drumming from Paul Revelli. Schermer piques my interest with the baseball-themed "Lover's Hall Of Fame," citing various relevant hardball references throughout the song. The song starts with Schermer yelling out, "Play Ball!" over top of a funky beat with wah wah effects on the guitar before proceeding to say that his baby won't get consideration for his lover's hall of fame. Of course he knows he's no superstar himself, singing, "... They won't put me in Cooperstown, but I'm proud of the the things that I done, at least I struck out swinging, looking for the home run ..."
I love the sound of the farfissa organ, an instrument not used enough in the blues world, but Delone pounds away on the keys on the up-tempo "How Much Longer?," with Schermer tossing in some solid rockin' guitar. "I Can't Let It Go" is a mid-tempo snaky blues that features Billy Price and L'il Baby on background vocals. The title cut comes up next, and it's one of the highlights of the disc with a creative original song that will have a lot of listeners nodding their head in sympathy to Mighty Mike's plight. 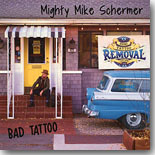 As for that bad tattoo that his baby has in a key spot, Schermer sings, "... she's got the name of some other dude in a bad tattoo ...," and "... what would make a hottie do something to her body that couldn't stand the test of time ..." There's some hot guitar here from Mighty Mike as well as a stellar baritone sax solo by Bernhardt. "Ain't That The Way Love Goes?" is a nice, mid-tempo shuffle with Chris Cain on electric piano(!) and co-producer Andersen providing the bass backbeat. L'il Baby returns to contribute backing vocals along with Andersen. Organist Jim Pugh lays down a solid foundation for the up-tempo feelgood number "One Thing Every Day," with gospel-ish backing vocals, this time from both L'il Baby and Bernhardt. Schermer pays tribute to his woman on the rockin' shuffle, "Hey Francine!," with some killer Link Wrap-style guitar and a fine organ solo from Delone. Schermer is definitely not looking for a long-term relationship when he sings, "... who needs tomorrow when all we need is today ..."
Aki Kumar guests on harmonica behind Schermer's echo-y vocals on the plodding blues, "Baby Down The Well," before moving on to the bluesy funk of "Suffocating Love." Cain joins in on his more normal instrument to share guitar duties with Schermer. "Stop Looking For Love" is a slow blues shuffle that wouldn't sound out of place on a '60s Excello Records compilation, with Rick Estrin summoning his inner Lazy Lester on harmonica. Bad Tattoo closes with a song that would be an appropriate "end of the set" type of song, the up-tempo "Up All Night." Schermer and his companion are heading out to an all-night blues club to "... party like it's 1979 ...," but that's okay because they can sleep all the next day. I've previously described Schermer's music as just plain ol' good fun, and Bad Tattoo is no exception. It's a good addition to his growing discography.